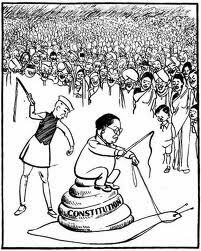 Cartoon Controversy: Thoughts on Dalit sensitivity and bid to belittle Dr Ambedkar's contribution towards the country! It is easy to dismiss the objection to the cartoon published in the NCERT text books by terming those who opposed it as non-liberals. But did we try to understand why the cartoon was considered offending? What surprised me were war cries sounded in media, as if demand to remove the cartoon had suddenly turned India into the most illiberal nation. Headlines like 'End to artistic freedom' in supposedly responsible news papers clearly showed a lack of understanding and sensitivity with regard to Dalits. At least, the newspapers & TV channels who cry foul should first have an inward look. Do they have even a single Dalit in their newsroom? Anyway, first my reason why feel the cartoon can be seen as offensive. 1. A friend of mine, who doesn't come from upper castes, and is almost free from any sort of biases, and is a humanist guy, once asked me, 'What this Ambedkar did?. [In Hindi, it was more harsh]. Coming from him, I was more surprised when he asked this question. Did you ever ask the same about what Nehru, Rajendra Prasad, Radhakrishnan or Abdul Kalam Azad did? And the fact is that everybody knows Ambedkar's contribution, not just about framing the constitution but also his lifelong struggle against the tyrannical caste system. In this fight, he not only helped Dalits but also did India a great favour. There was no discussion, he just said it casually. But if you are an 'educated' person and question his contribution, it means you are not a fool. You are either a hypocrite or someone who has been fed on prejudices. 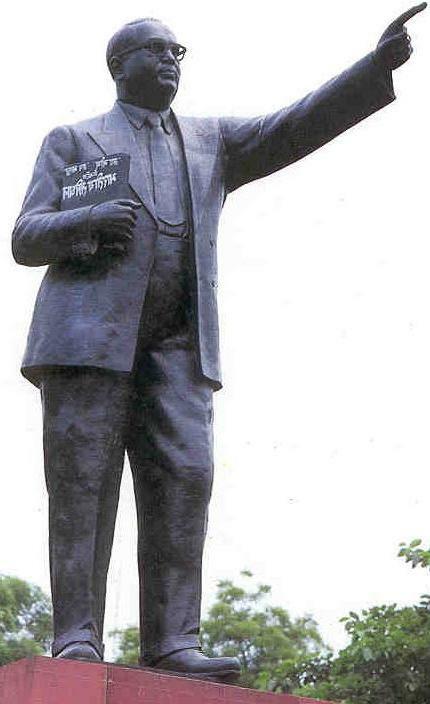 'Babasaheb' Dr BR Ambedkar is truly one of the most inspiring figures in history. Anybody who read his life history would be motivated. But there is clearly a design, or a deep [perhaps unknowingly] bias, that is responsible for an attempt to belittle his contribution to the nation. 2. As I rewind, I recall numerous incidents, when in conversations in colleges and schools, in different cities, friends often repeated a line. Places were not same but people [surprisingly] parroted an exactly similar line. '...he (Dr Ambedkar) just went through the constitutions of other countries and picked up the best portions....and created the bulkiest samvidhan for India'. I bet you must have heard it somewhere. It is said by those who can't draft a leave application but with such confidence as if they all had seen the 'cut and paste' job. The word 'bulky' is also used in negative sense. The aim is to show that Dr Ambedar did nothing special. 3. Now let me recount another incident when I was in IX standard. A teacher, one day, got so agitated that she poured her heart out in front of the class. She was angry that why lessons on Sir Syed Ahmad Khan and Dr Ambedkar were part of the syllabus. The fact was that in the pages on prominent personalities, there was a mere half page for each for them. Perhaps, it was a history book or social studies combined, but she didn't like even that much. Such antipathy! So if you feel that Ambedkar did something only for the Dalits, at least, even then he deserves a place. If a person does something for 20% Indians i.e. 200 million people of our nation, doesn't he deserve a half page in the book. If you do for 0.2% you deserve it. Why there is a hostility or a feeling from within among large sections to undermine him [and negate his contribution]? In these contexts, I personally think, the cartoon, could be deemed offensive. As it again, subtly, tried to send the same message that Ambedkar took a long time while framing the constitution. So much that Nehru, who stands behind, was fed up and he is holding the lash. Certainly this is not a cartoon that should be taught in text books. It drives the same point. If, as a non-Dalit, one can feel it, then a Dalit would surely feel that it is not appropriate here. There is no dearth of cartoons and please, no one talks about banning cartoons. You may argue that one can't belittle a towering personality like Bhimrao Ambedkar. But childhood is impressionable and the memory is long-lasting. If the caricature gives such a message, it should be removed. It is not sacrosanct. As far as offending others is concerned, we have more serious issues that remain untouched. Politicians get away with murders, hate speeches. Casteist oppression and violence remains one of the biggest concerns and still media remains oblivious to them. Such stories are ignored, not even carried in papers. 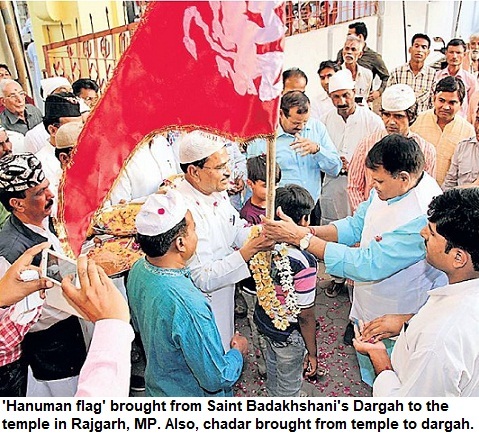 Its commonly said that the 'draconian' Prevention of Atrocities on SC/ST Act is used to frame others though those who say this never ask why conviction rates are so low under this law. You do joke about Ambedkar, you can surely criticise him. Haven't book been written against him? But spare the kids, please. This cartoon is already getting published everywhere, in magazines and papers. We have enough of prejudices that kids, even after going through the cleansed books, retain lot of false notions. Sometime back an English TV channel programme showed series on country's best schools where the most bright kids of a famous Rajasthan school termed all Mughals as invaders. That's how images get into mind. One could understand if you dislike Mayawati, a politician. In fact, sections of urban 'educated' elite, that included Muslims, were prejudiced against her even in the beginning when issues of her wealth and parks hadn't got splashed in media. But for an iconic reformer and that too Ambedkar's standing who passed away decades ago, there is no need for anyone to be insecure or resentful, at all. Do you feel he is eclipsing your heroes. Why else there is an antipathy then. Is it because you feel Ambedkar is followed by those who are mostly poor or inhabit slums in cities, as per your perception. Still, it is irrational if people don't like blue flags aflutter in a locality. Often passing by a locality, I have heard comments about the 'BSP blue'. Why should someone be repulsed with that? But it happens, its ingrained in some of us. Isn't it a fact that Ambedkar statues are desecrated most. Why? You know the truth. Congress wasn't too comfortable but it had to give Ambedkar a place. It anyhow, had little time to think of leaders except Nehrus and Gandhis. However, they did appropriate himself or were forced to do that. The BJP begrudgingly followed suit due to electoral compulsions. Who can ignore Dalit voters? But its leaders [remember Arun Shourie] and cadre always appear more or less uncomfortable with him. If, Indian nation, can look back with some satisfaction, at the past century, a lot of it is due to the contribution of Ambedkar. Without him and his efforts--in terms of awakening Dalits and warning the nation about the issue of caste-based racism--we would far far behind today. These days it is difficult to believe that till [just] 25 years ago, there was a regime in South Africa, where blacks lived as second class citizens. The country managed to overcome apartheid. America, with a baggage of centuries, also solved a host of issues long back. In US media, they let in the non-privileged sections, particularly, Blacks. We are yet to evolve into a society of responsible people. Our collective attitudes, biases and prejudices remain a lot similar to what they were till a few decades back. Its very easy to talk about getting liberal but practicing it is far more difficult. In this case, I must say, there is need to understand why the Dalit groups and communities found the cartoon in bad taste. Goodbye. Summer vacations have just begun and it's a wonderful opportunity for you to teach your kids an extra language. If the children learn an additional language its a big advantage for them. That's not just an additional skill but it opens mind, and gives exposure to an entirely new culture. Frankly, it's not too tough, because kids have great ability to pick up things, quite fast, at that age. For example, if you are Tamil, Telugu, Kannada or Malayalam speaker living in North India, there are chances that your kids can't read books in their native language. Similar is true for Bengali, Punjabi, Marathi, Oriya or Gujarati speakers in metros or living in Southern cities. Your kids, perhaps, understand a bit when you speak your mother tongue. But if you make them read the script, it will be a great achievement. If, however, you are a Hindi speaker in a North Indian state, and none of you [parents] know a third language, you can always find an elderly neighbour who would be too willing to teach his language to your kid. In fact, kids enjoy a lot when they start learning a new language. You would be surprised to see their enthusiasm, trying newly learnt words with friends and amid family members. But what is necessary is to instill the drive in them. Firstly, you must get good story books. Coloured books with lots of photographs, caricatures and cartoons attract kids. Don't say that your child doesn't want to read, and rather remains hooked to television, watching the cartoon channels. The kid surely doesn't watch TV all day. You can promise him or her a big gift, once they learn the basic and finishes a few books. Kids love a bit of challenge & if you give them books that have stories or even comics, they'd learn fast. Even I was astonished with my little daughter's sudden interest in learning, when she suddenly started recognising words, and began reading all by herself. And all this without going through the primers. She is now reading headlines in Urdu newspapers also. Though in Urdu-speaking [mostly Muslim households], Muslim kids are taught Arabic and hence most of the Urdu alphabets are recognised by them, but still, in India, Urdu is not as much in schools and street. And it takes an effort to make your kid read Urdu, because the nastaliq font is different from Arabic. And, of course, Urdu is an entirely different language. The sounds 'bh', 'gh','jh', 'th', 'ph', 'chh', 'Dh', 'Drh' and even French 'zh' [as in vision] are totally unique in it and so is the manner in which they are joined. Then there are four 'T' and three 'S' in the alphabet. While a section of parents feel that children will someday learn it and hence don't take it seriously, the reality is that once the child reaches teenage, it becomes difficult for him or her to sit and seriously learn the language due to the load of studies. Another section feels that there is no use in learning it. Similar is thinking among speakers of other languages also. I have umpteen friends who hail from Maharashtra but can't read Marathi, despite the closeness of script. Even kids born in Keralite families who live in North India, can't differentiate between Manorama and Vanitha. Each language opens an altogether new dimension and the door to a new beautiful world. Just give it a try. First focus on reading, as writing can come later.